Ive been interested in exploring the opportunities around the Fakes Framework for testing BizTalk solutions for a while now, and until recently its been sitting as one of the many blog articles I have intended to write but haven't got around to. This week we have started looking at a BizTalk 2013 project and this presented an excellent opportunity to explore this idea. I decided to look at the common problem people have faced in the past when you want to unit test some code and it has a dependency on the underlying BizTalk assemblies and they were difficult to mock out with one of the common mock frameworks. One of the most common examples was when you write a helper class for an orchestration and the method takes an XLANGMessage object as an input parameter. This is quite a common pattern that people have struggles with. Often the way people would handle this was to write a method that takes XLANGMessage and in that method extract the message body then call a 2nd method which did the logic required. This approach meant you could easily unit test the 2nd method and the first method people would often skip unit testing. Although this wasn't ideal, it often worked and we would just accept this method would be tested as part of the BizUnit tests of the entire solution. Let's take a look at a sample method that we may be trying to test. You can see that we want to extract the message body from the BizTalk message and then return it as a string. The big problem with unit testing this method is the dependency on the XLANGMessage object and how difficult it could be to correctly construct this object to pass into the test. Once we have a Fakes assembly we can then create Shims and Stubs of the various objects which are within this assembly. Im not going to go too much into the detail behind shims and stubs, but will provide some links to reference articles later. We can now write a unit test where we can fake the reference to the underlying BizTalk assemblies and make them much easier to work with and allow us to focus on the method we want to test. The below code snippet shows how we will create our test. 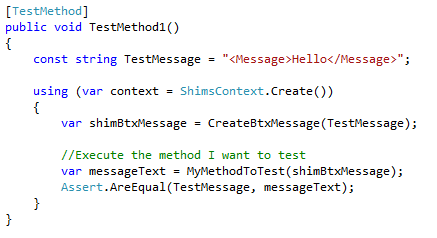 It will call a helper method which will create the shim of the XLANGMessage and then pass it into our method to test. You can see in the above method that our test becomes very simple while still using the XLANGMessage or BTXMessage which derives from it. One key point to note in this method is the use of the ShimContext and its disposal which ensure the shim framework is created and cleaned up after our tests have used it. Now lets look at the method which creates our message. You can see this method is where the fakes framework magic is happening. We firstly create a stub of the XLANGPart object and assign our string to be its stream that is returned when we call the RetrieveAsType method. 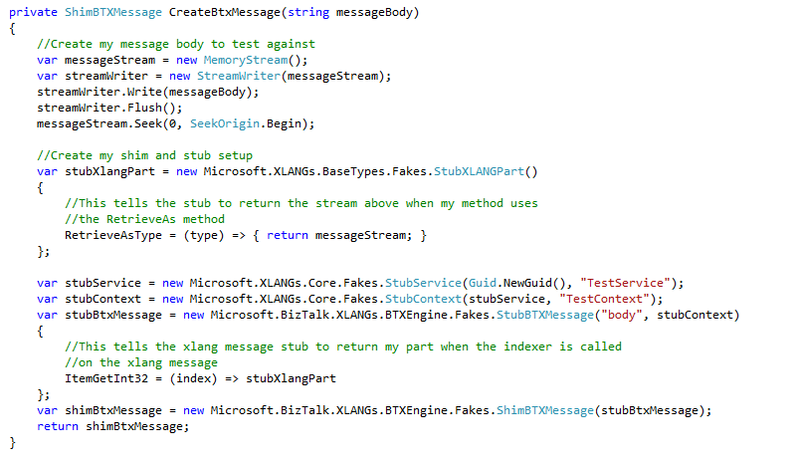 We then need to create stubs of a couple of other classes which are needed to create the stub of the BTXMessage. On this message we set the return for the intexer property to be our XLANGPart which we created earlier. Finally we create a shim of the BTSMessage and return it. This method for creating a fake XLANGMessage is probably quite reusable for most of your unit testing scenarios as we tend to usually interact with the message body in a helper class but not that much else. Hopefully this example has shown you how easy it can be to use the Fakes framework to test code which you may have previously thought was untestable. This happens a lot when you have dependancies on the underlying BizTalk assemblies in your unit tests. I think there could be quite a few other opportunities where this framework could be used to complement our existing BizTalk testing practices and I plan to explore these over the coming weeks. good Once the unit installation can be over,	Clash Royale for Windows 8	downloaded record to open up and set up it applying BlueStacks. Clash Royale for Computer nice. good It is normally one of the few software that permits cross-platform transferring. shareitforpcapp	You will discover the software show up in the search outcomes. SHAREit PC Free nice. good You can acquire signal when they happen to be broadcasting. Bigo Live APK Download	and as well socialize with people. BIGO LIVE is usually nice. awesome then install it on your windows os and obtain appreciate	play view apk	Sadly, Play View for iPhone isn't offered at App Store nice. good you watch video and movie streaming around the	Mobdro for android	is included in professional version. Those that nice. good Youtube Downloader from our site or other partner	peggo app	a video clip extremely spontaneous than other nice. it prevents the uneven noise around you. Simply have	facetime for pc	If your reasoning that you intend to have this FaceTime App. It is likewise possible to shut off location setups. Musical.ly Login	little to no pay, now YouTubers can earn money, or at the very. Good all the tehy inforamtion about Androdumpper APK Official site to download free WPS connect. You will see hundreds of groups inside this section including different type	xhubs	xHubs APK for Android directly without any problem or concern. in cheating the game levels . Want to send SMS for promoting your business. Then contact RKV IT Solutions for Bulk Sms Services. We are the leading Bulk Sms Service Provider in Patna, Bihar. You should follow some steps to setup your own emulator. It is most complicated work but Download Wechat will make your emulator for your PC/Laptop. Make sure you follow any tutorial to make your Emulator. Can't use your Epson L220 because of driver issue? Here is the solution. Download epson l220 driver by clicking on the link and enjoy. For only Android Smartphones and also tablet	machineliker.me	your Android device and break out automobile. site here. We strive to get all your issues sorted out at the earliest. As this app is not available in the King Root Arts so I have decided to come up with a dedicated Framaroot apk blog from which you can download all versions of Framaroot apk. On this blog, I will cover all details related to Framaroot including FAQ and how to install framaroot. Thats really great infomration thanks for that. video clip streaming app created for Android. Below In this short article,	imobdro	video clip stream from the web. Mobdro Online TV for Android is presently supported. There are many benefits with the LiteBlue Online Login services that the users get. It will most importantly allow the users to access their employment status, work status and career guidelines within the Postal community. If you are one among them after that find out about How to obtain	Musically	your ability as well as imagination by making videos. BSEB is going to announce the long waited 12th results soon for the academic year 2017-18. This article will give you the full update regarding the https://www.bihar12thresult2018.netand all about it. Students searching for the same on the internet can take the reference of this post and this can help you get the answers for all your queries regarding BSEB 12th exams and results. So, read this and obtain the all the latest information. BSEB is going to announce the long waited 12th results soon for the academic year 2017-18. This article will give you the full update regarding the result and all about it. Students searching for the same on the internet can take the reference of this post and this can help you get the answers for all your queries regarding BSEB 12th exams and results. So, read this and obtain the all the latest information. BSEB soon going to announce Bihar board 2018 result on their offical website . This time they assured that their will no link fail issue on result day. BSEB 2018 result is going to announce the long waited 12th results soon for the academic year 2017-18. This article will give you the full update regarding the BSEb 12th RESULT 2018 and all about it. Students searching for the same on the internet can take the reference of this post and this can help you get the answers for all your queries regarding BSEb 10th RESULT exams and results. So, read this and obtain the all the latest information.